Horsemen (1974), Early '60s Revisited (1974), Poems In Naked Wonder (1978), The Witmark Demos (1983). Then we had bootleg CDs. The Witmark Demos (1994), The Witmark Years (1994), Through A Bullet Of Light (1994), In The Pines (1998), Let My Poor Voice Be Heard (2007), Where Are You Now My Blue Eyed Son? (2008). I may have missed some but they all had those famous demo recordings, from Witmark and from Leeds, some had some of them, some had all. 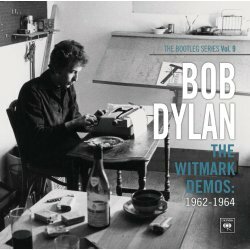 And now we have Bob's new album in the Bootleg Series: The Witmark Demos: 1962-1964 (2010) and so we have them all again, but now as an official release. A good opportunity to give information about the tracks one might think, but far from that. So gives the 60-page booklet no specification at all for the recording dates of the 47 tracks, except that they're from the period 1962-1964. The sequence of the songs looks familiar, with only some small differences. We can assume that this list is probably chronological correct, but we can only guess about that for there's no explanation given. It can mean that sources as Heylin or Olof's Files are wrong in dating Talkin’ John Birch Paranoid Blues to winter 1963, as it now fits in the part from march 1963. But nothing is revealed and it can also be a mistake of the compiler. 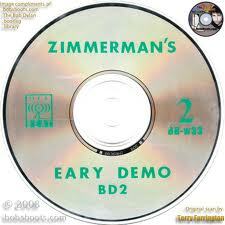 "All of the recordings included here were created to be used for demonstration purposes. In some cases, especially on the earliest tracks, the songs were recorded to be released on acetates so other artists could perform them. As time progressed, the songs were often just rough sketches hastily recorded so that the publisher could get the songs down for purposes of copyright. Consequently, there is an extremely wide range of sound quality. We have done an exhaustive survey to use the best sources wherever possible. A good bulk of these recordings come directly from the Warner/Seven Arts master tapes which, unfortunately, were in spotty condition. We've tried to present them in the unadulterated way in which they were stored at the Witmark and Leeds archives." Does that bring us any further? Where did they make their survey for the best sources if not in the archives? Which recordings belong to the good bulk? Isn't it likely that all master tapes are in the archives, accompanied by notes? A date can be very helpful with copyright matters. It almost seems as if we've got just a rough sketch hastily put together. And if they had to use other sources than the master tapes, were that acetates, copies of tapes or just our well known bootleg recordings? 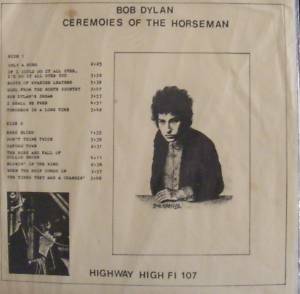 And then, since we have it now official, how is the sound of this new Bootleg Series Vol. 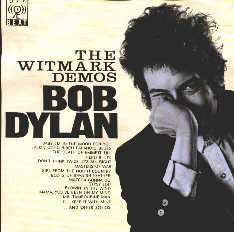 9, The Witmark Demos: 1962-1964. We took a look at three songs with EAC and compared them with the same songs from the Hollow Horn Recording Artist Vol. 1: Let My Poor Voice Be Heard.There is much difference between them and to my ears the official Standing On The Highway goes faster. Wouldn't it be interesting to compare all songs with all different sources we already have?